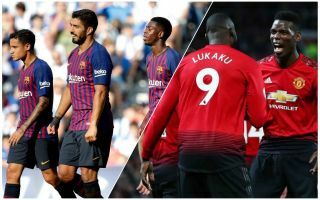 Manchester United could reportedly get the chance to seal the transfer of Barcelona misfit Philippe Coutinho in a swap deal involving Paul Pogba. This latest piece of Coutinho transfer speculation comes from Spanish outlet Don Balon, who claim Barca are eager to go all out to beat Real Madrid to the signing of Pogba. Despite showing his best form yet in a Man Utd shirt this season, the France international’s future at the club is in some doubt again as Marca claim his agent has been looking to get him a move away from Old Trafford and that he’s decided he wants to join Real Madrid. Don Balon claim, however, that Barcelona believe they could also be in the running and could try a tempting swap deal involving Coutinho, who has also been the subject of transfer speculation lately. The Independent have linked United with the Brazil international, who could be an ideal signing to replace Chilean flop Alexis Sanchez. Meanwhile, Chelsea have also been linked with the former Liverpool star by Diario Gol, stating he could be the Blues’ preferred option to replace Eden Hazard. There seems to be a large number of ways these deals could go, but United could well be tempted to cash in on Pogba now after an inconsistent career in the Premier League. Manchester United to land Philippe Coutinho in Paul Pogba swap transfer? And while Coutinho would be a gamble after his struggles at the Nou Camp, he was one of the best players in the country during his time in England with Liverpool. This would be a blow for Chelsea, however, who will struggle to find anyone as ideally suited to playing that Hazard role in their team as they sweat over the Belgian’s future.